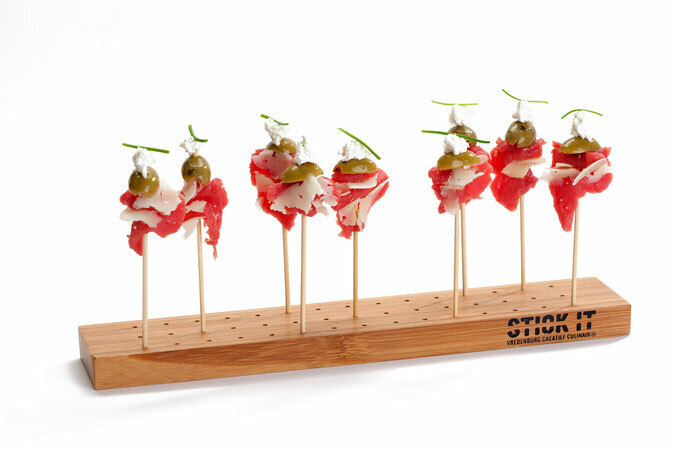 Using Stick it VCC® lets you serve finger foods on skewers straight up in order to create an attractive and original visual presentation. An added benefit of Stick it VCC® is that it provides you with an easy way to serve finger foods in a busy environment, such as a café, catered function or bar, because the skewers remain upright in the Stick it VCC® plank. All standard kebab skewers fit in the Stick it VCC® and this makes it exceptionally simple to use. The finger foods look as if they are floating in air. This makes it an extremely eye-catching an appetising way to serve a range of finger foods including fried appetisers, hors d'oeuvres, small bites, treats for children's birthday parties and product presentations.